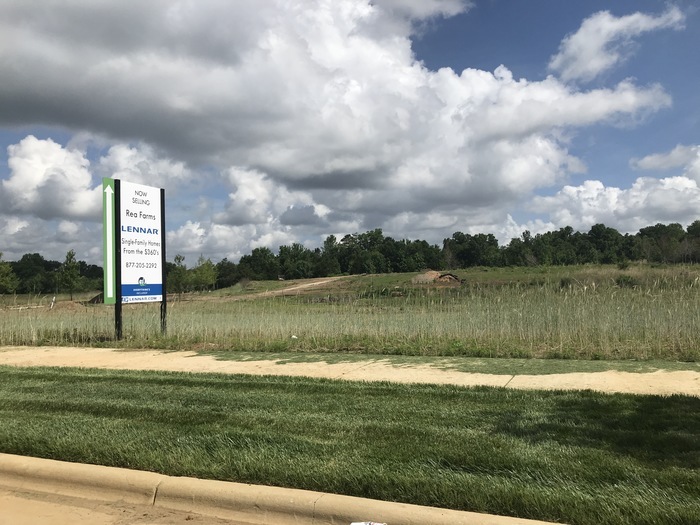 Developer Lincoln Harris describes the 188-acre project alternately as its own little town and a “true destination.” By the end of the summer, they expect thousands of people to live, work, play and shop at Rea Farms — the urban planner’s dream. Rea Farms will be buzzing with people by this summer. The only thing open so far is a massive Life Time Athletic fitness complex opened in December. That will soon change. The development’s retail space is 70 percent leased already, and stores and restaurants will begin opening this fall. 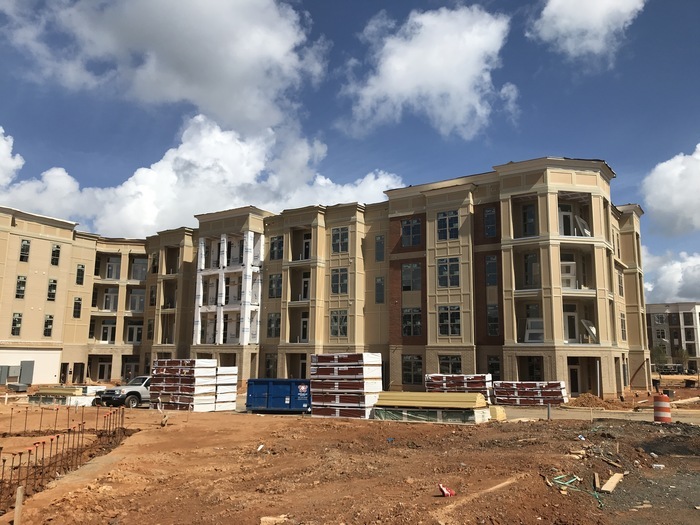 500 apartments at The Links at Rea Farms are set to open in June, followed by a Harris Teeter prototype store to open in late summer. The apartments will have fairly premium prices. Studios will start just under $1,200 per month, with two-bedrooms around $1,700 and three-bedrooms over $2,100. 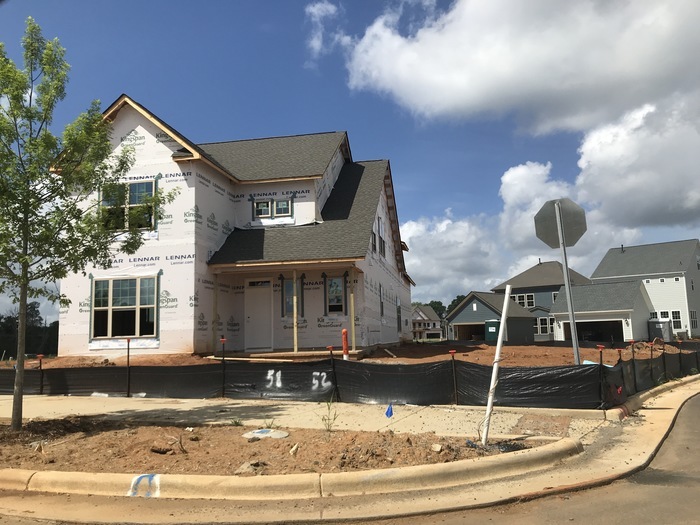 Lennar is building 200 single-family homes as well that appear to be closing in on completion. 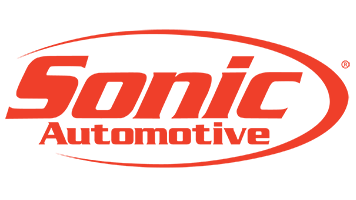 Pricing will start at $360,000. Other phases of single-family home development are a ways in the future. There are also plans for 500,000 square feet of office space — about the same size as the First Citizens Bank Plaza building Uptown. A senior living center and a Hyatt House hotel are in the works. A K-8 public school with a focus on science, technology, engineering, arts and math will come in a few years. Big-name tenants have already started lining up for the retail space. 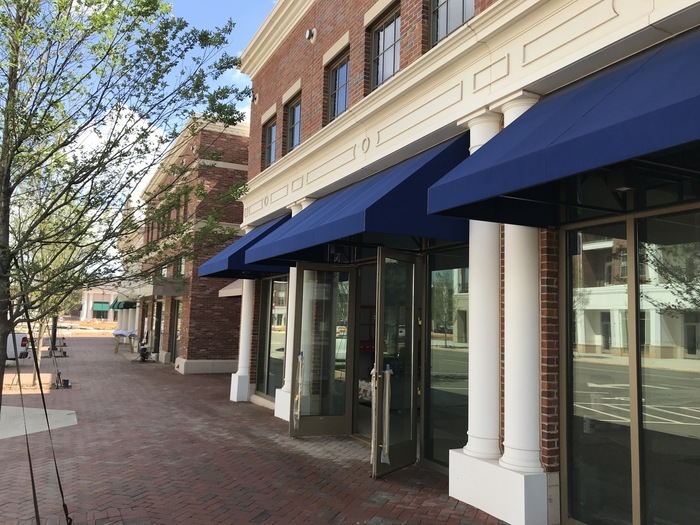 Rea Farms will have 115,000 square feet of retail space — the same size as Atherton Mill in South End will have when its renovation is complete. 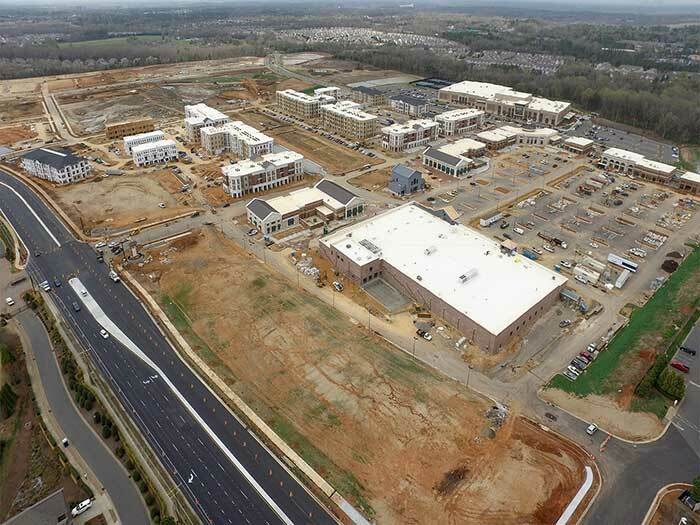 But the mix here will be more reminiscent of Blakeney or Birkdale Village, other major suburban shopping destinations. Improper Pig will put its third location here. Tandur Indian Kitchen is bringing its second Charlotte location here. Pizza Peel will have its fourth location here. An upscale men’s barbershop chain named Roosters has its second location here. 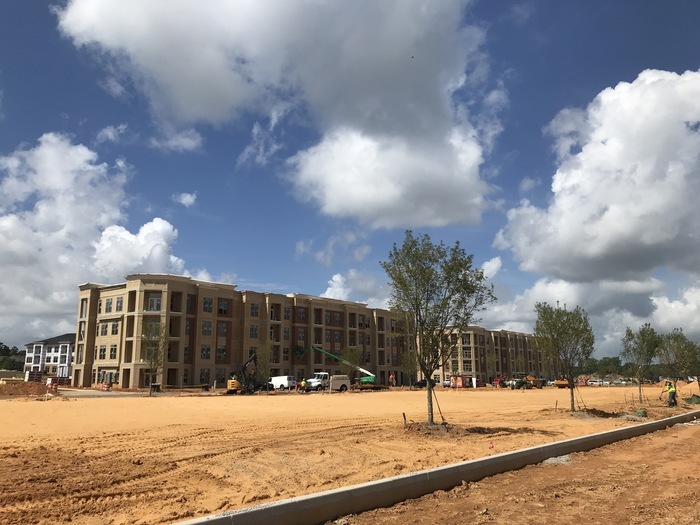 Clean Juice, Flour Power Kids Cooking Studio, Little Big Burger, Fuzzy’s Taco Shop, and an original Italian restaurant concept named Sensi have also all signed leases at Rea Farms. 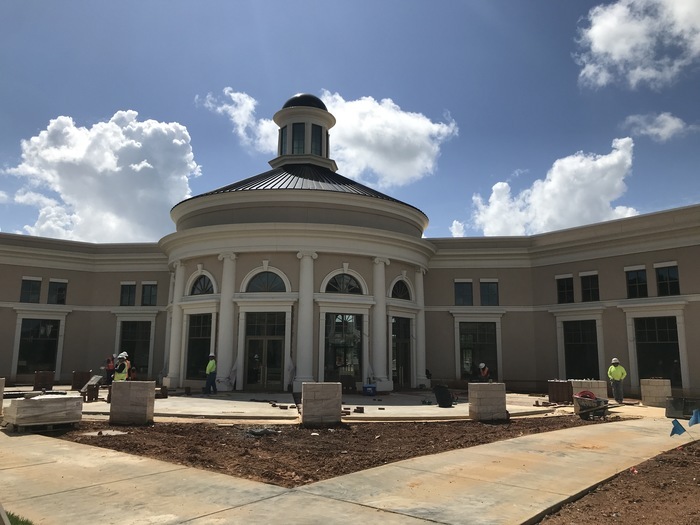 Most of the retail will revolve around a five-acre “Village Green,” a large green space headed by an event venue that will regularly screen movies when the weather’s warm. Think Symphony Park at SouthPark mall. The Village Green is still brown, but it should be sodded soon. 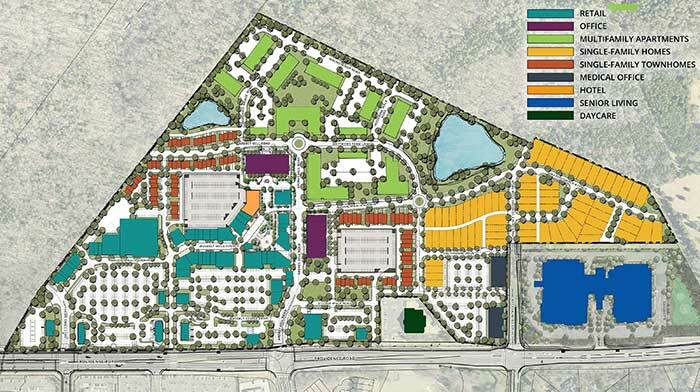 Will Rea Farms be more than a shopping center? Of course, the “live, work, play” mantra isn’t new. 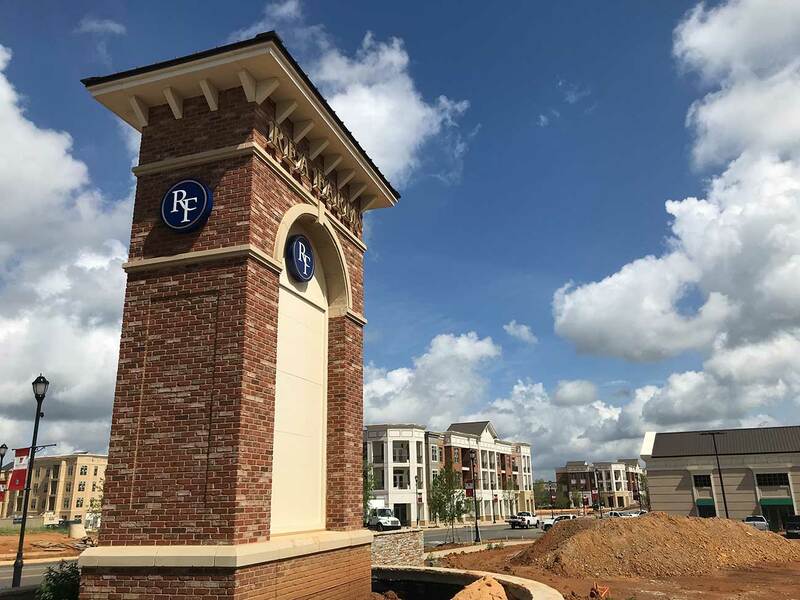 Charlotte heard the same sort of thing as Waverly opened — and it’s just across Providence Road from Rea Farms. Waverly entrance on Providence Road. 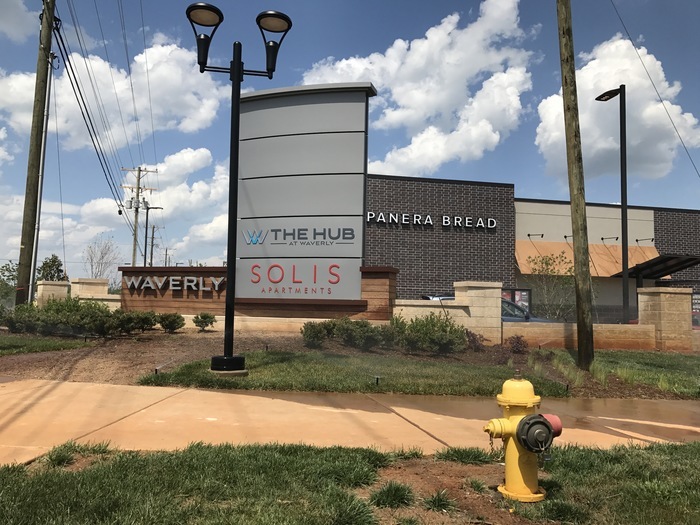 While Waverly is still new, you could make the argument today that it still feels like typical suburban sprawl — especially on the large part of the development that fronts Providence Road. It’s too early to tell exactly how distinct Rea Farms will be. But there are key differences you can tell by touring both properties today. 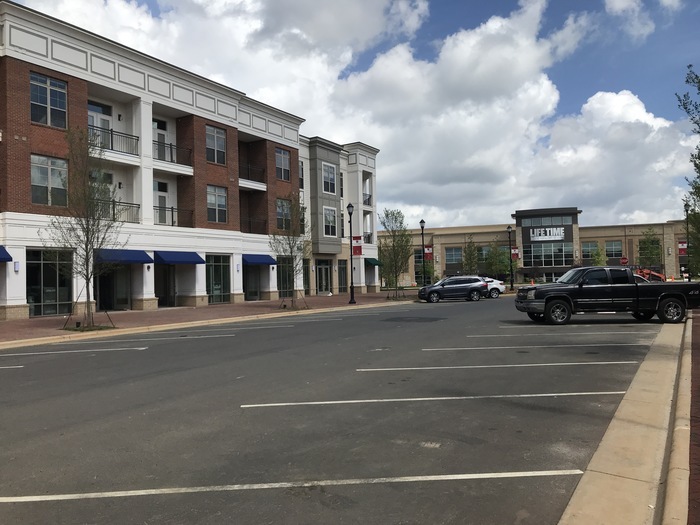 While Waverly’s retail is surrounded by standard rectangular parking lots, Rea Farms tucks its massive asphalt slabs on the periphery and goes with diagonal parking near the retail. This makes Rea Farms feels a bit more Phillips Place than Walmart. Rea Farms has a lot more diagonal parking than typical suburban developments. 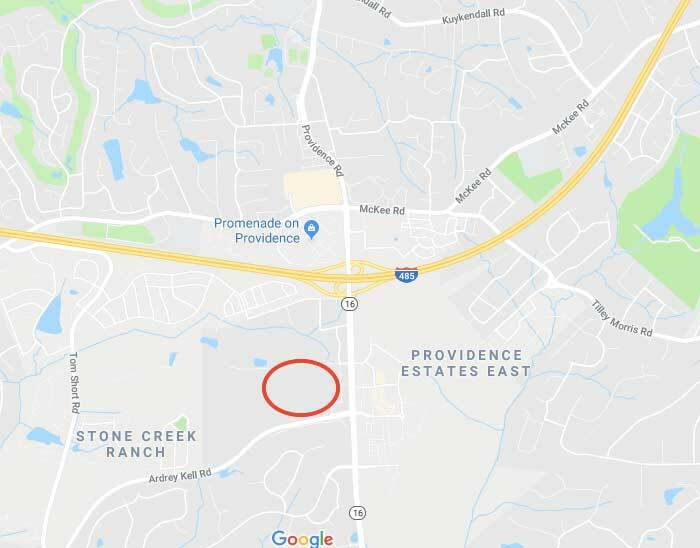 Rea Farms is more secluded, with entrances from Golf Links Drive and Ardrey Kell Road rather than a direct frontage on Providence Road. The Village Green also has the potential to be an investment that pays off handsomely. Waverly is already successful and will continue to be. 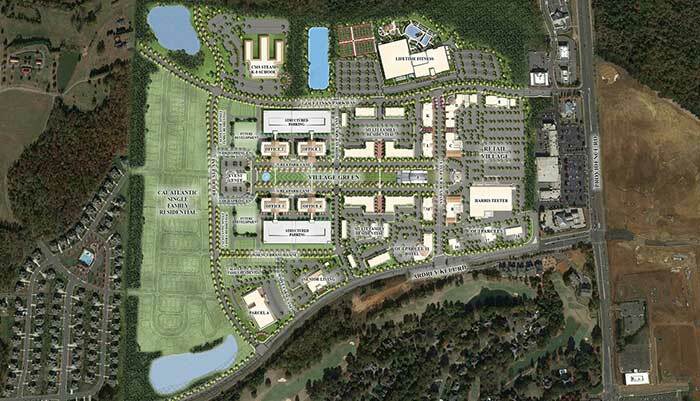 But on the surface, Rea Farms looks like it will bring Charlotte closer to that suburban/urban dream.